I could not sleep last night, until well after 2.00am. I’d been to a church meeting; and not an easy one. In that meeting, I was deeply ashamed at some attitudes that were expressed. I was appalled at how some in our church community have been abusing others. I was also staggered, uplifted, and enthralled at the wisdom, and the love, and the grace, of some folk; especially those who had most reason to be deeply angered. It was a hard meeting, but good. This perception of our situation changes everything. It means a trifling annoyance becomes a major point of contention. It means a glorious, wonderful expression of faith, becomes nothing, or even something to be resisted. This passage contains the famous John 3:16. It is also not far from the famous John 3:3 about being ‘born again’. Such verses have developed a life of their own. We never come to these verses without baggage. For many congregations and individuals they are a battle standard, a rallying cry, or a litmus test of the faith. For other folk they are a symbol of much about an expression the faith which is embarrassing and alienating. We have a basic division in the way we see things, which we bring to these verses. Our perception of the situation changes everything. Others of us see that those who do not believe are already condemned. People have loved darkness rather than light, and their deeds are evil. Condemnation and judgement are writ large; we have escaped by the skin of our teeth; and that only by God’s forbearance, which we in no way deserve. John and Jesus understood this division. Much more prosaically, Jesus could have said to Nicodemus, “You either get this, or you don’t. It is not something you reason yourself into, but something you are given.” There is a mystery here. ... John is tending away from a picture of God who wants to punish people forever towards a picture of God who wants life for people. It has not reached the point where John would have to contemplate a God who loved so much that the thought of shutting people out from love and hope beyond a certain point of time and into everlasting punishment would cause grief and self contradiction. How do I preach a gospel in which the good news is not that we can be saved from God, when some of my listeners are coming with that baggage, that presupposition, that point of view? The point of view changes everything. And change comes like the wind; you either see it or you don’t. What part can I play? Imagine standing at the base of Uluru. The sheer rock face is so high it is half the world. The silence is alive with feelings, with awe, with spirit. There is nothing to hear, and yet everything. Like thousands of Australians, going back over millennia, this place both belittles and embraces us. Silent contemplation is our only response. And then we hear it. "Oh, come on, Tony. It’s too hot. This is boring. I’m getting sand in my shoes, and there are flies. Let’s go back to the motel. I need a drink. This is so boring." And their discontent whinges its way past the same rock, through the same thick numinous aura which has arrested us, completely blind and untouched. 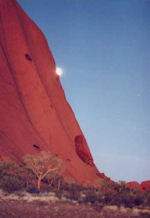 How could you be at Uluru, and be so untouched? I’ll talk about Mt Woodroffe which is 130km south east, as the crow flies; about the long climb to the top. You clamber over the rocks, fight off the flies, pull out the grass seeds and the burrs, sweat out litres. It is hot, calf burning climbing, and the horizon is constantly false. There is always further to climb. You begin to agree with those who stayed at home; why would you come out in all this heat to climb an unpleasant hill. At the top, at last, the panorama is breath taking. The climbing party is silenced by the vastness of creation, the depth of the panorama, and the beauty of the hanging valley and waterfall now so tiny below them. And on the far horizon are Uluru, and Kata Tjuta, clearly visible, the view untrammelled by miles of desert and inhospitable, life draining country. Vision. How would it be if we could read John 3:16-18 like that? How would it be if it stopped being a God who threatens, and a life which threatens, and a need to constantly beg forgiveness in case God shuts us out of the Kingdom? How would it be if despite all the prickles and spinifex on the climb, life became a thing of beauty where God is loving us and we are at ease; where we are totally loved, and where the thought of judgement has faded away because we know God will never condemn us... ever; where fear of judgement never even occurs to us? I can’t give you that; it comes like the wind. But I have found this. When I follow Jesus and seek to live the way he would, it kind of ‘brings the wind up.’ Change blows around me; change that is not all threatening and scary. A fresh breeze that is cool, and full of relief. Something has begun to change me. Seek to do love, rather than criticise and condemn. Look for the good and the hope, rather than focussing on the pain and the bad. It lets the wind in. It heals. Threat and pain become freedom and opportunity. God’s love flows over us.